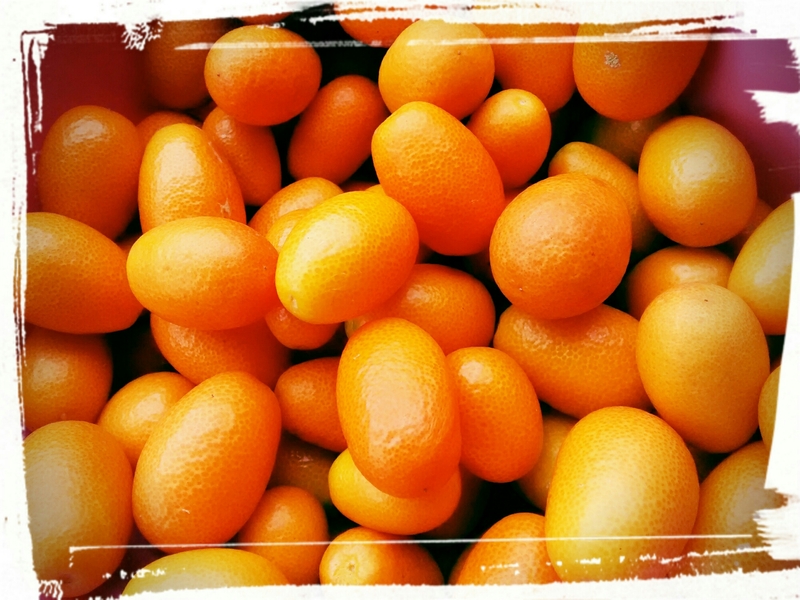 Who has a good kumquat recipe? I took an extra loop on my walk the other day, and it yielded an unexpected benefit. I noticed that a neighbor had loaded kumquat trees! I wondered if she was interested in exchanging some kumquats for some kumquat marmalade. When I went back to ask for some, she was so excited that she offered to help me pick them! Within a few minutes we had harvested about two gallons of the perfectly ripe fresh kumquats. I have had kumquats and strawberries in various stages of cooking, soaking, and macerating over the past few days. I can eat maybe 5 plain at a time. They are delicious, but not something that I can just sit and eat in one sitting, like say, grapes. I need serving suggestions. How do you like to eat kumquats? What we would do you do with so many kumquats? I may go take her up on her offer to go back and get more, but I want to make good use of what I have, and not waste these delicious little fruits. I know I have some creative and resourceful readers- what are your ideas? I have never had a kumquat. What do they taste like? They’re a citrus, but when you eat them, you eat the whole fruit at once. The juice is sour, so you get a quick burst of sour citrus, then as you chew, the sour diminishes and you taste more sweet as you eat the thin peel. The peel is actually quite sweet. They’re definitely a potent little pop of flavor, but I don’t think many just eat handfuls upon handfuls at a time. I’m trying to think of a way to use the sweet peels without needing to add lots of sugar. I’ve seen these in the store, but fresh has definitely got to be better. Can’t wait to see what you do with them. I have never eating kumquats. You do have quite an eclectic group of fruits and veggies that you harvest, plant, and obtained. I guess I’ve led a somewhat sheltered life when it comes to the varieties that you talk about. I may need to think about branching out a bit. I have to say that I have tried many different varieties of vegetables since I have started gardening, simply because they were supposed to be able to survive or do well in North Florida. I have found many new veggies that I love this way, and others I try to find a way to prepare them so they taste good to me. I probably would have never bought mustard greens, or okra, or perhaps wouldn’t have been interested in the kumquats. Kumquats are a yummy little bite- sour juice at first, then almost a candied taste at the end.